Today's book review is for one that I find to be such a gem in YA literature, Rainbow Rowell's Eleanor & Park. I briefly mentioned this title in my Book Haul and how I was immediately drawn in by the cover, a depiction of two assumed lovers linked by music. I was also intrigued by the quote on the cover that called this book "smart." While "smart" has different meanings to individuals, when it references a book, it conjures the image for me of a book that encapsulates something about reality that so many of us miss. It's smart, not because it makes puns about mathematics or physics, but because it has the uncanny ability to capture (better than a photograph) how people really are with just the use of words. This is what I hoped this novel would be. Keep reading to find how it met my expectations. "You look like a protagonist. You look like someone who wins in the end." Initially I was thrown off at the titled chapters of "Eleanor" and "Park." They carry the characters names, but they're not told from first person POV. Instead, they are each written in third person omniscient narration that reads very closely to that of a first person POV. (If I ever meet Rainbow Rowell I would be curious to ask her why she made this choice). The narration allows you to get very closely into the minds of Eleanor and Park although remaining that semblance of distance that you get with third person narration as opposed to first person. Although the book was a very easy read, I didn't feel as if it was too simple that I couldn't appreciate it. In fact, I think the writing was rather superb. The flow was great, especially the dialogue. long story: The pacing of this neither too fast nor too slow. Telling a love story that the audience can be a part of involves time and I think this novel did just that. It slowly introduced you to the characters and in the paraphrased words of John Green, you fall in love the way you fall asleep; slowly, then all at once. Eleanor is a plump redhead who views herself as an awkward ugly duckling. I liked Eleanor because I found she was very easy to relate to. Some of her thoughts almost felt neurotic at times, but then I often think the same of my own thoughts, which made her all the more realistic. Park is a half-Korean who grew up in a predominantly white neighborhood. His Caucasian, veteran father ensures his well-adjusted life in this community. And while that should resonate with an Asian who grew up as a first generation American in a non-Asian community, I didn't love Park. He was a rather neutral character to me. He was kind. He was sweet. I liked his scenes with Eleanor. I liked his scenes with his family. But when it was simply Park being Park, I didn't find him as well constructed as Eleanor. Eleanor was filled with fears, insecurities, and emotions that I felt I wanted that same level of depth with Park. Speaking of Park's family, Park's Korean mother was one of my favorite characters. She reminded me of my mother. Park's mother can be harsh and judgemental (just like my mother), but you can sense her compassion and heart. Rowell did a great job with this character. Here you have a story of star-crossed lovers like that of "Romeo and Juliet" or a more modern story like 500 Days of Summer. 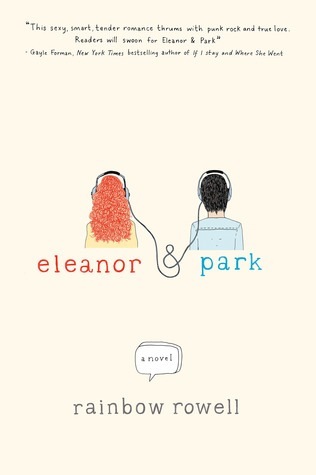 But what separates Eleanor & Park from the other two? Immediately, you get a sense of their physical shortcomings. Eleanor is "unattractive" and "big." Park is "short," presumably a dreadful shortcoming (no pun intended) for a male. They are not your stereotypical Hollywood couple. While it didn't particularly matter to me one way or the other whether the couple is physically attractive or unattractive, I thought it was a nice touch to move away from the Hollywood view that we as an audience can only appreciate attractive Caucasian couples. The romance in this book was very sweet and nicely paced. My favorite part had to be the beginning. The start of it all had me on the edge of my seat. It was all very cute and I was almost jealous to witness first love at the start of the blooming. If you've ever been in love than you'll be familiar with how it can completely submerge you. Rowell drags you under and makes you remember that feeling. I could write a whole essay about race in Eleanor & Park but I'll try to keep it short. Note, I still had to categorize it under the 'long story' section. As much as I enjoyed the love story, the story I couldn't avoid was that of race. Eleanor makes the distinction at one point that she is "stuck" in her own skin as opposed to "comfortable" in her own skin. Park who mumbles and grumbles over his small physique, a trait he assumes he has inherited from his petite Korean mother, is also not entirely comfortable in his own skin. So while Eleanor & Park is distinctly different from other popular love stories with its "less attractive" protagonists, it has recurring themes of identifying oneself by ones outward appearance. Whatever race you are, whether or not you are comfortable in your skin, you are not only stuck in it, but those around you will define you based on that immutable fact. However, it's important that you yourself don't simply identify yourself in that manner as well. Reading this book is a journey that you ride alongside Eleanor and Park, and a journey I really enjoyed. I would definitely read it again. Let me try to get this straight. you will not like this book. If you want a realistic piece of fiction that while submerged in all it's reality can still be beautiful, I would recommend Eleanor & Park. :P " Short story: see 'Long story' " I see both, always! I really want to read this, mostly for how the couple deals with the race part. And I like the alternating perspectives style too. Just stumbled upon your blog from Google when I was searching for Essie polish comparisons. Am loving your blog! Thanks for this book review, I will check this out - seems like my kind of thing. Have you read One Day by David Nicholls? I'm not the type to enjoy romance novels but I really liked this! Thank you! Happy to hear you like my blog!